Are you helping new customers find your business? Do they tell you how they found your business? Flipping through the local directory (Yellow Pages, Thomson Local, etc) or over the internet? Research shows that over 70% of today’s consumers use the internet to find local businesses and services. You might be losing potential customers to your competitors who have a stronger online identity. To compete and claim your rightful share of customers you need a strategically positioned online presence. While many might think of a rightly targeted website as their first point of contact with the potential customer, it is instead a simple listing on Google Local that will be the first step towards your online identity. Let me demonstrate the above with an example. 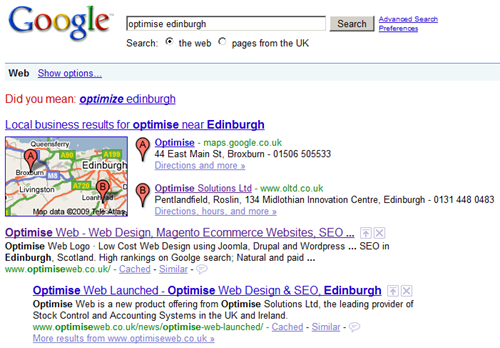 Searching Google with the keyword ‘Optimise Edinburgh’ returned the following results (on the 23rd of June 2009). Supplying the word Edinburgh in the search field triggers Google to list some top results from Google Local just above its organic search results. You will notice that Optimise Solutions appears on the Google Maps listing even before the free listing of Optimise (Web) Solutions. Google assumes that I am searching for local businesses and presents the top listings from its Local Business Centre results. Try this with a keyword that relates to your business and specify your town or area. Are you there? Some businesses might be surprised that they are already listed with Google Business Center. Google collects data from other directories and populates its own. Your listing on Google Local might have come from Yell.com or similar web directories. In such a case where you are already listed, you might want to claim your business listing by providing a valid phone number and verifying it. In order to claim your listing, you will be asked to register a free account with Google. Follow the steps provided by Google to verify your phone number. Once you have reclaimed your listing, you can customise the details and content of your listing. Google allows you to add a wide range of information to your business listing. Getting your business listed on Google Local is just the beginning. You need to make sure that your listing appears on the top of the searches. This is where custom writing your listing comes to play. Unless you have a well written listing that is rightly targeted to your customer segment, your listing is as good as not being there. There are numerous ways that you can tweak your Google listing for better performance and higher placements. These techniques are learnt through practice and experience, and most SEO experts will be able to help you with it. Optimise Web offers Google Local Business Center listing writing services from £50 onwards, depending on your requirements. We can spice up your listing with images, videos and reviews too! Call 0131 448 0483 or email info@optimiseweb.co.uk to get your listing noticed. So, are you ready to get new customers?